A South Korean military diver searching for survivors from a navy ship that sank off North Korea has died. 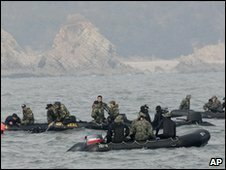 The diver lost consciousness as he searched wreckage of the Cheonan warship which sank after an explosion on Friday, the military said. Rescuers have been working to get inside the ship, split in two by the blast. Forty-six sailors are missing. The cause of the explosion is not yet clear, but a senior official has said it could have been a North Korean mine. South Korean President Lee Myung-bak visited the scene of the wreck on Tuesday, flying in by helicopter to Baengnyeong island near the disputed inter-Korean border. He also ordered the military onto alert, saying: "Since the sinking took place at the front line, the military should thoroughly prepare for any move by North Korea." Fifty-eight crew members were rescued when the Cheonan went down late on Friday. Officials say they believe that some of the 46 sailors still missing could have survived in water-tight cabins in the stern of the ship. More than a dozen South Korean ships are involved in the rescue effort, plus a US vessel. The diver who died was one of dozens brought in to try to gain access to the wreckage. The cause of death is not known. Another diver was also been taken to hospital, military officials said. A navy spokesman said the divers were working in "a very vicious environment" with swift currents and murky visibility. "Our goal is to get into the ship and find any survivors but at the moment it is extremely hard to do so," the navy spokesman said. On Monday, teams used a hose to inject oxygen into the stern via a crack, but divers who knocked on the hull received no response. The cause of the blast that sank the ship remains unclear. Defence Minister Kim Tae-young has said it could have been caused by a mine laid by the North during the 1950-53 Korean War. He said it could also have been a mine that the communist state intentionally sent floating towards the South Korean vessel. But an internal malfunction has not been ruled out and military officials said establishing the cause of the blast might have to wait until the ship is salvaged. The area has been the scene of deadly clashes between the navies of the two Koreas in the past.